This website was last updated on 19 March 2019. Black Sea Property PLC seeks to generate capital gains through the development, financing and sale of property in Bulgaria, including the prime areas of Bulgaria’s Black Sea coast, the ski resorts and the capital, Sofia. The UniCredit Building – The acquisition of the UniCredit Building was completed on 23rd October 2017. 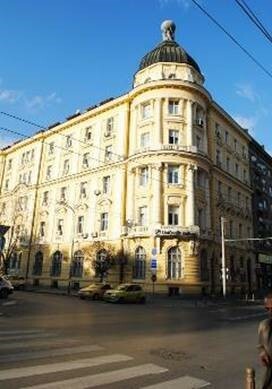 The building is on 1, Ivan Vazov Str. Sofia, which is a prime location in Sofia. Camp South Beach EOOD – CGE owns four plots of land situated next to each other with a total area of 63,193 sq.m., with permission to develop a camping complex. The four plots are located at the beachfront on the Black Sea Coast, close to the City of Sozopol. The Board is seeking to create a diverse portfolio of opportunistic and value-added Bulgarian real estate assets, including development land, partially completed construction projects and completed buildings. The portfolio may comprise direct holdings of real estate assets, as well as investments in collective investment vehicles, direct and indirect investments and co-investments in distressed companies holding real estate and real estate assets that need restructuring and further financing, and controlling and non-controlling stakes in real estate companies listed on regulated stock exchanges invested primarily in Bulgaria. The focus will be Bulgaria but exceptionally the Board may look at real estate opportunities and investments in neighbouring countries. The Board will strive to build a portfolio in order to maximise value for its Shareholders. 10 – 30 per cent of funds to be invested in apartments hotels and holiday homes, each investment with a minimum of 20 rooms or units. Initially, the Board’s focus will be seeking companies where there may be a number of opportunities to acquire interests in undervalued properties. The Company may be both an active and a passive investor depending on the nature of the individual investments. The Board will place no minimum or maximum limit on the length of time that any property/investment may be held. The Board intends to retain sufficient cash resources for prudent management of the Company’s working capital requirements.The Board will however ensure that any investments meet criteria designed to mitigate risks. There will be no limit on the number of properties or investments into which the Company may invest, and the Company’s financial resources may be invested in a number of propositions or in just one investment. The Board believes that the status of the Company as a property investment company will enable it to fund real estate investments or acquisitions using a mixture of cash, equity and/or debt and intends to actively monitor these investments. Mr Borrelli, aged 60, qualified as a Chartered Accountant with Deloitte, Haskins & Sells, London in 1982. He then moved into investment banking and has acted on a wide variety of corporate transactions in a senior role for over 20 years, including flotations, takeovers, and mergers and acquisitions for private and quoted companies. Mr Borrelli was chairman of Ablon Group Limited, a real estate group with a portfolio valuation of circa €400 million in Central Europe (formerly listed on the Main Market, standard segment, of the London Stock Exchange prior to being the subject of a successful cash offer in 2013). He is the chairman of Xpediator PLC, a company listed on the AIM market of the London Stock Exchange. Mr Naydenov, aged 47, is a resident of the Republic of Bulgaria and is a fully qualified Bulgarian lawyer with more than 20 years of experience. He is a partner with the law firm Boyanov & Co, Sofia, where he is head of the Corporate and the M & A practice group. His areas of speciality include corporate law, financial markets, mergers and acquisitions and bankruptcy. Mr. Naydenov has provided services to, and has previously represented clients on the boards of, various Bulgarian companies. In addition, Mr Naydenov has advised on real estate related transactions throughout his career. Mr Lagadinov aged 44 is a carbon markets and climate finance specialist with more than twelve years of experience in the area. He has participated in the negotiations of emission reduction transactions since 2002 and worked at companies which focused on trade of EU’s carbon emission allowances and investments in different emission reduction and renewable energy projects globally. Currently, Mr Lagadinov is Managing Consultant at Navigant Consulting Inc, a specialized global professional services firm. Previously, he spent over 9 years with the trading desk of one of Europe’s biggest utilities and was Head of Analysis at Sandbag Climate Campaign, a non-profit research organization, which is engaged in advocacy and the study of European and British climate change policies. Mr Lagadinov has an MSc in Economics and an MBA from IESE Business School. Ventsisvava has more than ten years of experience at international financial institutions with focus on real estate financing. She has previously been responsible for attracting and retaining key international clients, investors and developers. Since 2016 she has been an executive director of Phoenix Capital Holding AD and Phoenix Capital Management AD with responsibility for structuring acquisition financing and for the development and management of commercial real estate. Miroslav is a construction engineer and real estate valuation specialist with more than ten years of experience. He has been involved in the project development and project management of major developments in the Bulgarian real estate sector in residential, office, industrial properties and shopping centres. Currently, Miroslav is an executive director of Phoenix Capital Management AD and chairman of the management board of Phoenix Capital Holding AD. The Board is responsible for supervising the Manager and for the overall investment activities of the Fund. The Directors recognise the importance of sound corporate governance, whilst taking into account the size and nature of the company. The Directors intend to comply with the principles of the Combined Code in so far as possible and appropriate give the company’s size and the constitution of the Board. The Board has established an audit committee. The Audit Committee determines the terms of engagement of the company’s auditors and determines, in consultation with the auditors, the scope of the audit. Originally domiciled in Jersey, the Company was re-domiciled to the Isle of Man with effect from 20 July 2016 and continues under the Isle of Man Companies Act 2006 with the name Black Sea Property PLC and with registered number 013712V. The Company operates as a close ended investment company for the purposes of the Isle of Man Collective Investment Schemes Act 2008 and the Isle of Man Collective Investment Schemes (Definition) Order 2008. The main country of operation is currently Bulgaria. An application for admission for the shares to be traded on NEX Growth Market has been submitted. Dealings commenced on 31 August 2016. As at 19 December 2017, the number of securities in issue is 1,269,407,896. 19.98% of Black Sea Property PLC share are held in public hands. The Companies articles of association contain certain restrictions on the transfer of shares.